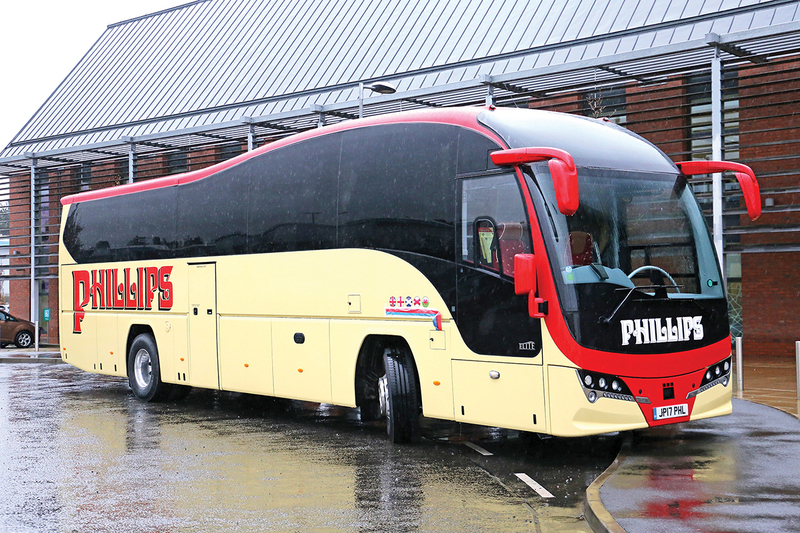 Pictured before the launch with the name yet to be unveiled is Phillip’s 12.6m Plaxton Elite Volvo B11R. 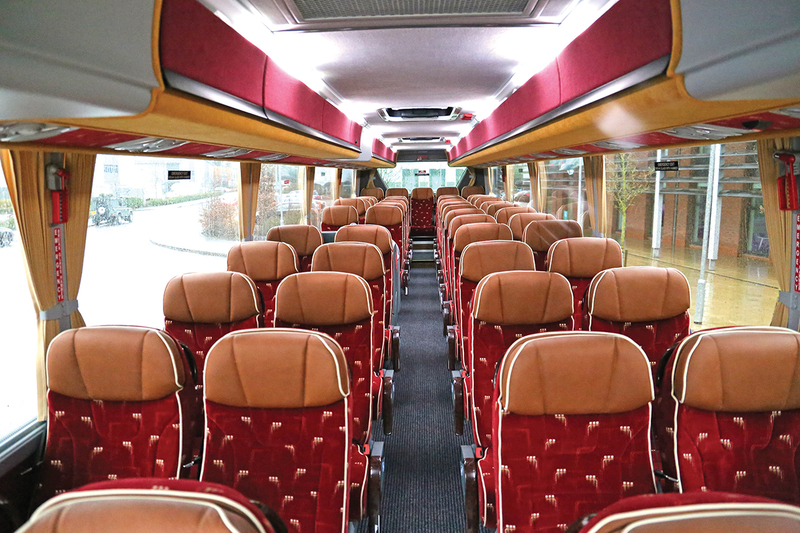 The interior features the Brusa Extend 500 seat with fully adjustable wraparound headrests. 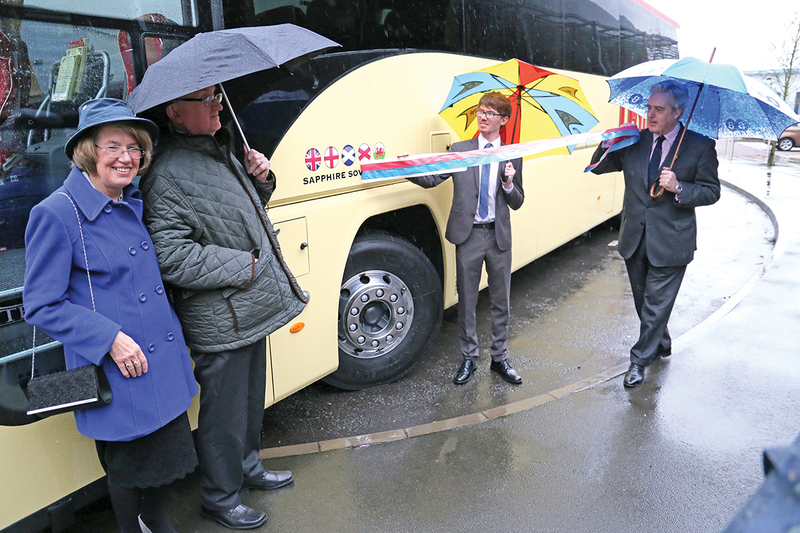 MP Mark Garnier pulls back the tape to reveal the name of the new coach, which is Sapphire Sovereign. The Phillips family. Jane, Celia, Alan, Julian and Gemma. Customers queue to inspect the new coach. Alan Phillips has been fascinated by coaches for a very long time. 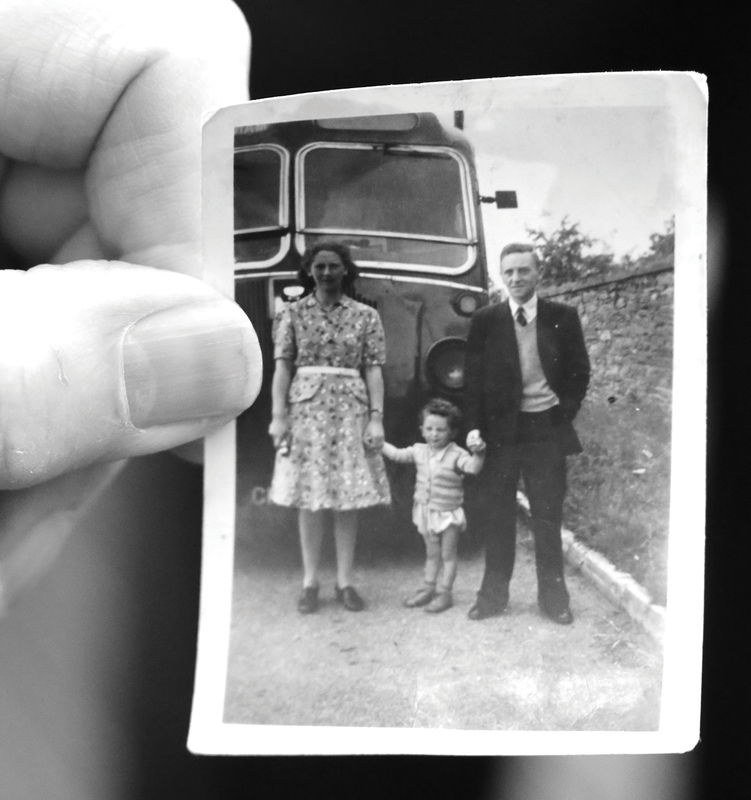 Here he is with his parents and a Midland Red SLR type around 70 years ago. The new Elite B11R has seen red added to the traditional cream livery. The earlier Elite B9R was named Diamond Sovereign. 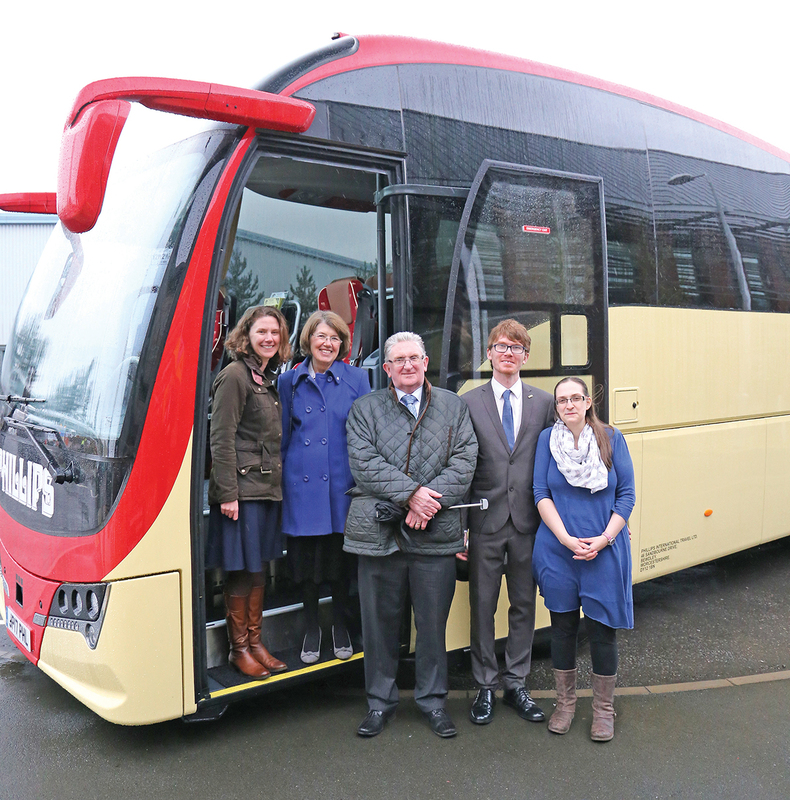 One-coach operators buying brand new full sized coaches are few and far between. 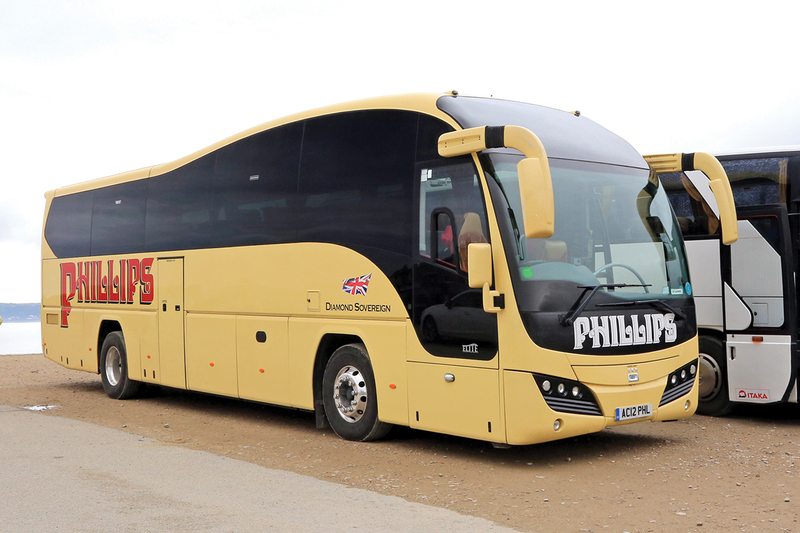 An exception is the Bewdley, Worcestershire, based company, Phillips International Travel, which operates its own tour and excursion programmes using a high specification vehicle that is replaced on a five year cycle. The latest acquisition stays true to the company’s traditions as every coach ever operated has carried Plaxton coachwork, all 14 of them over the past 37 years. In the early years, the company had run several coaches at one time, but Alan believes that it was the decision to just have one brand new coach that enabled the business to take off and they have not looked back since. 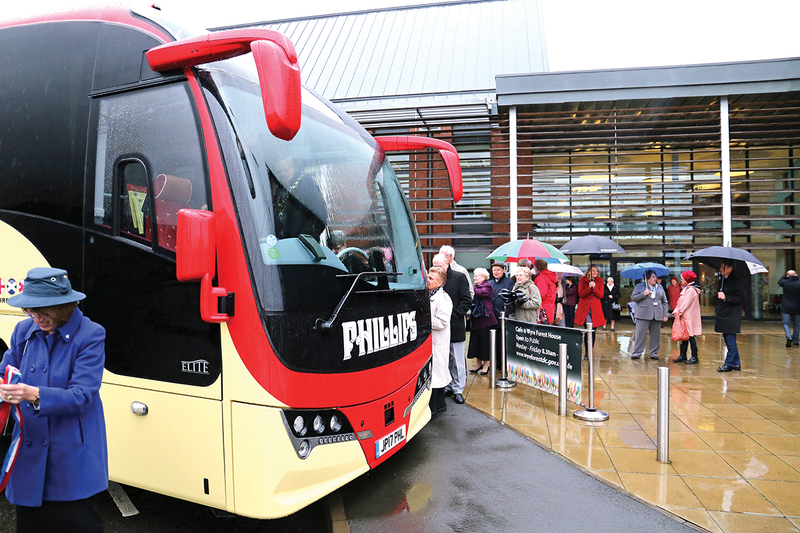 When, five years ago, I went to the handover of the company’s previous coach, a Plaxton Elite bodied Volvo B9R, it was expected that it would be the last to carry the Phillips International name, as Alan and Celia Phillips had anticipated that it would be time for their retirement party. Between them they have an impressive 91 years of coach driving experience and Celia is a former Lady Coach Driver of the Year. However, plans have changed and their son Julian and his fiancé Gemma have come into the business, after a major career change. Wyre Forest District Council’s new headquarters building was the venue for the launch in the presence of Council Chair, Rose Bishop, a large number of Phillips International’s customers (some of whom have travelled with them from the outset in 1980) and suppliers including Hartshorne’s the local Volvo dealership and Plaxton represented by Simon Wood. 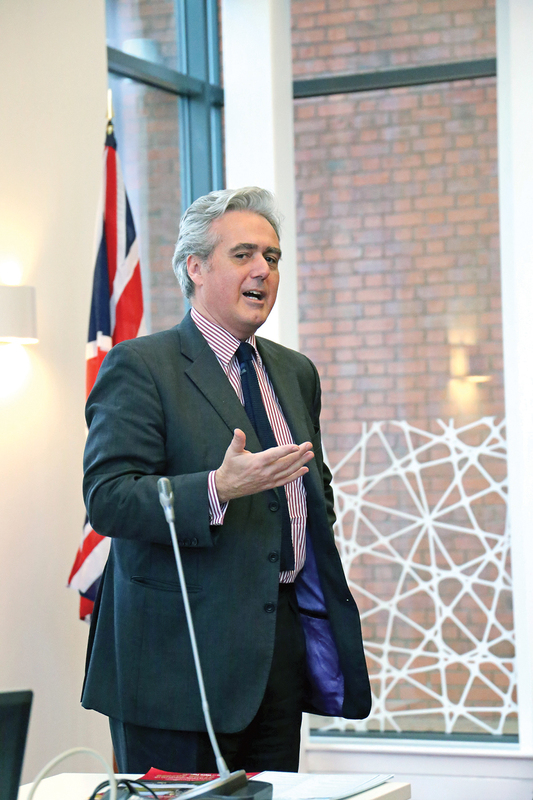 Julian previously worked for Wyre Forest MP, Mark Garnier, who is now Parliamentary Under Secretary of State at the Department for International Trade, and it was he who gave the launch speech for the new coach, as he had done when the previous one was delivered. He claims to already have the date in his diary for five years time when Phillips’ next coach will be due. Praising the new driving force behind the business, Mark Garnier said it was a sad day for him personally when Julian had decided to change careers in 2015, describing him as ‘an astonishingly diligent young man.’ Julian later explained that he had enjoyed what he was doing but was prompted to make the move because he wanted more control over when and where he worked, having recently become a father again. The couple now have four children with the arrival of Ezri to join Freddie, Elliott and Florence. There will be more celebrations in August when they get married. With the speeches conducted in the warmth of the offices, their culmination prompted everyone to troop outside where the coach was waiting. It is traditional for Phillips to name their new coaches, usually with a royal connection. The last coach was called ‘Diamond Sovereign’ and, as Mark peeled the tape off the coach side, it revealed the new coach to be ‘Sapphire Sovereign,’ honouring the duration of Queen Elizabeth II’s reign. The Phillip’s family is unashamedly patriotic, not only manifesting itself in the determination to buy British, but also in the family motto, ‘Patriotism leadeth me’. Family values are at the heart of what the company is about, and though she is not employed within the company, Julian’s sister Jane was also present. Her daytime job is rather different as she is a Reservist Medical Support Officer. She has recently returned from six months in Somalia on a UN mission with the African Union. Popular with customers and often favourably commented upon by drivers Alan encounters when in Europe, the obvious choice to replace the company’s first Elite was another Elite, this time on a B11R chassis rather than the previous B9R, which covered 211,000 miles during its stay. At 12.6m long, it is marginally longer and has 49 rather than 47 seats along with a centre continental toilet and servery including hand dryer and vanity unit. Julian played a big part in the internal specification which features Brusa Extend 500 recliners trimmed in Kneitz fabric with Orion leather headrest centres and piping. They have three point belts, walnut finish seat back handles, centre armrests, seat-back tables with cupholders and adjustable footrests. Driver and courier seats are upholstered to match. Trimmed rack locker doors are fitted and the coach is equipped with Thermo King X900 air conditioning. The parallel lift locker doors are powered on the nearside and manual on the offside. Pleated curtains are fitted and the whole of the saloon is carpeted. I think Alan was joking when he suggested customers should take their shoes off before boarding. The Volvo chassis features the D11K eleven-litre engine rated at 420hp coupled to I-Shift automated manual transmission. 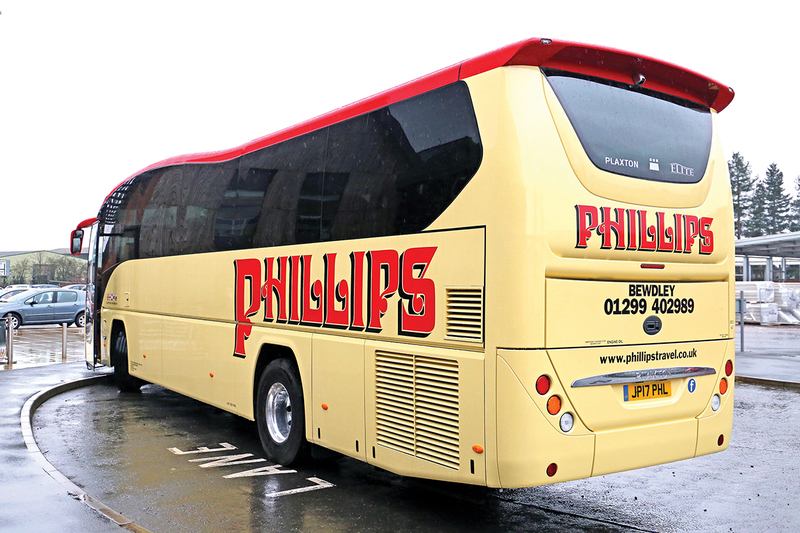 Alan Phillips spoke very highly of the support he has received from both Hartshorne’s and Plaxton, citing examples of outstanding service from both. Some years ago, Hartshorne’s managed to rebuild an I-shift gearbox that failed on 23 December and have it back on the road by Christmas Eve. ‘That’s what I call service,’ said Alan. Julian and Gemma’s influence on the business can already be seen in new driver uniforms, a Facebook presence and the addition of a red roof and front section to the traditional all cream livery. These are relatively minor changes because the key elements of the recipe remain the same. Julian commented, ‘It has been ticking over as a successful business for the past 20 years. It is the personal touch that keeps people coming back.’ He believes customers like the fact that they get a commentary during tours so that they can learn about where they are going, but without the distraction of videos or the radio. Also crucial, and one of the reasons pictures of the coach at destinations they have visited are pasted on Facebook, is that they do not cancel tours they advertise if the numbers are lower than anticipated. ‘People don’t like cancellations,’ said Julian. Alan revealed that the most extreme example of the policy had seen them take a coach to Monte Carlo with only 12 on board, ‘Every one of them thought it was marvellous’ he added. With Julian and Gemma, Alan and Celia will still be involved going forward and Alan will still be driving on occasions, but he’ll also be spending a lot more time in the loft with his model railway.